Malik Brothers Electronics is an electronics mall in Kharian. 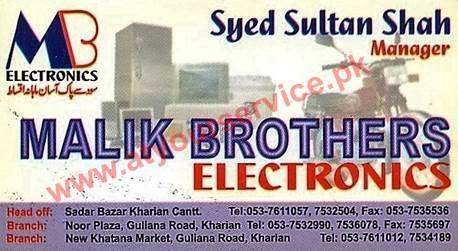 Malik Brothers Electronics is located in Saddar, Kharian. It sells Refrigerators, Air Conditioner, LED TV, Mobile, Motorcycle, Cooking Rang, Home Appliances, Kitchen Appliances, Laptop, Washing Machine, Generator.